Connections between people, or real community, is an issue in ministry in general. I think that one of the struggles in youth ministry is to be more people based than program based. We have become a church of programs that we say have a purpose, but really we don’t even know the people who attend those programs. An outcome of the first problem is the fact that students’ faith isn’t becoming their own faith. We must work on allowing them to investigate their faith in a safe environment if we are to ever allow it to be their own faith. Many are just following the faith of their friends or parents. Another issue that we should be focusing more on is inner-city and “fringe” type of neighborhoods and young people. Another issue is that of personal holiness, from youth ministers to parents to students. I would include myself in that, too. We should all take a long hard look at our personal walk with God. Youth Ministry is responding effectively to many things. One of the things I believe we are doing correctly is the entry-level things that give students a glimpse into what we are about. Unfortunately, as I stated earlier, we don’t go very far beyond that. Service. Many youth ministries are active in their communities and are reaching out to help underprivileged people in their neighborhoods. Focus more on people than programs. Focus on being relevant without being relative. Focus on integrating the young people into the life of the church. Focus on global youth ministry for more than 2 weeks during the summer. 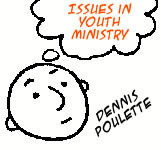 Dennis Poulette is youth ministry seminary professor in Mexico and blogs at YouthMinistryTV.com and The Poulette Family.